Every year when summer turns to fall, soups start to sound really good, and using the crockpot feels like a good idea. 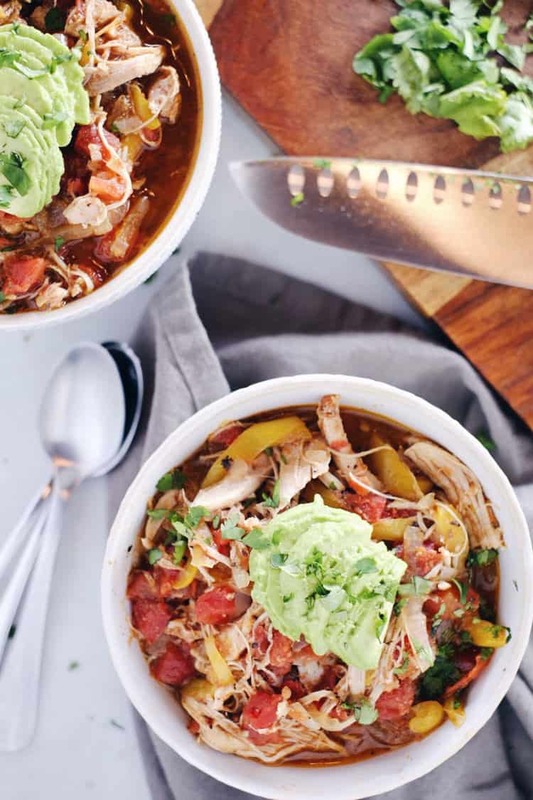 That is exactly what we have been doing now since the weather turned chilly, and this crockpot chicken enchilada soup is one we’ve had on repeat! It’s so tasty and warming. It’s easy to make in the Instant Pot too, check out the video below! We usually make something in the crockpot on Sunday or Monday to have in the fridge for the week. We use it for lunches and easy leftovers for busy days. On Black Friday this year we purchased an Instant Pot, and holy moly is it cool! I really wanted an Instant Pot last year, but decided that we already had a crockpot and probably didn’t need another kitchen appliance. Well, then I thought about it all year long and still wanted one when Black Friday rolled around this year, so we did it! 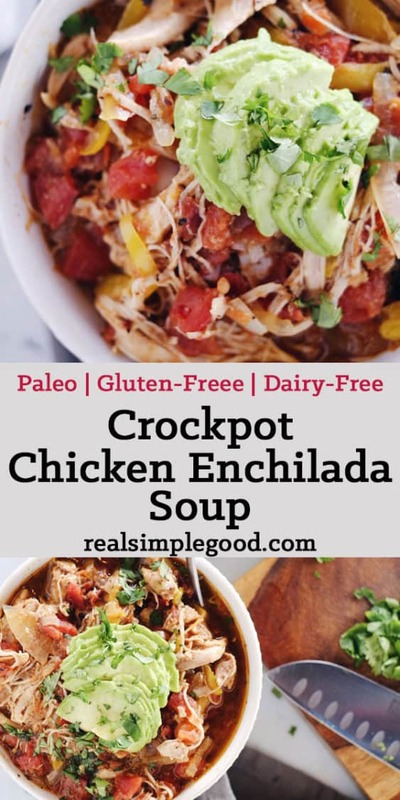 I’ve been playing with it since it arrived, making shredded chicken for chicken salad as well as this crockpot enchilada chicken soup. It’s true. I still love our crockpot, and I’ll tell you why! I love that you put something in and it cooks all day, warming your home with the smells of yummy food. You just don’t get the same effect with the Instant Pot. The benefit of the Instant Pot though is that rather than taking 6-8 hours to cook, you can make this soup in 20 minutes. Yeah – that’s pretty cool! Alright, you really don’t want to miss out on this one! 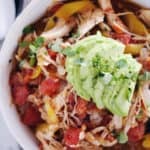 Prep your crockpot or Instant Pot and get this yummy crockpot chicken enchilada soup cooking. Let us know how it goes by leaving a comment below. Also, take a photo and tag us on Instagram @realsimplegood, so we can check it out! 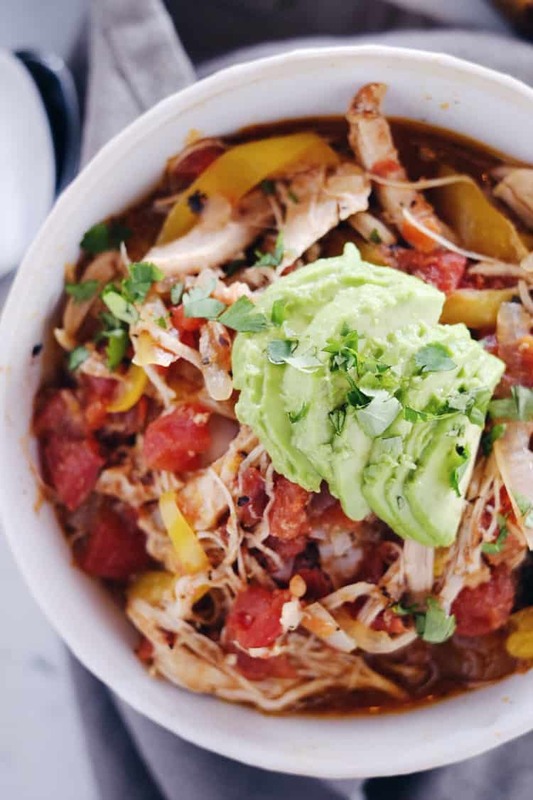 Since the weather turned chilly, this crockpot chicken enchilada soup is one that we've had on repeat! It's so tasty and warming. Prepare all of the ingredients as noted above, and add all of the ingredients, except for the garnish ingredients, into your crockpot or Instant Pot in the order listed above. Cook on low for 6-8 hours in the crockpot or on high for 3 hours. For the Instant Pot, cook for 20 minutes on the manual setting at high pressure with a quick release. Once done, use two forks to shred chicken in the crockpot. 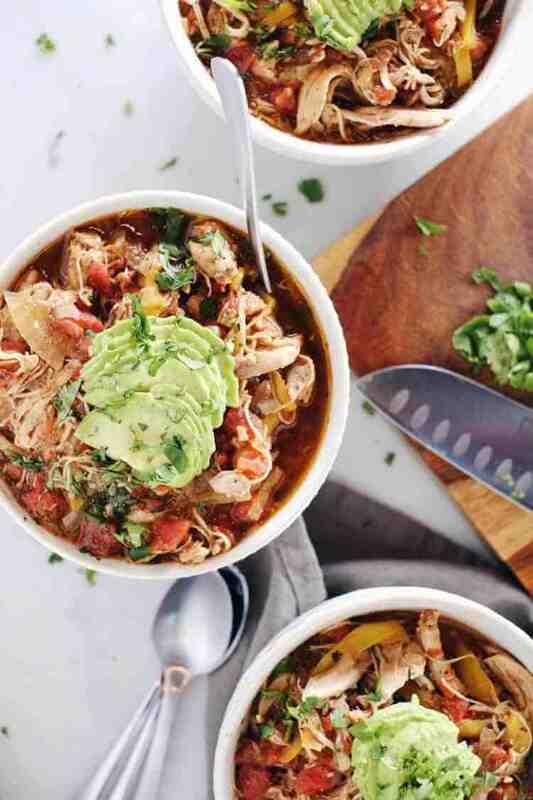 Ladle into bowls and serve with avocado and fresh cilantro. This was amazing! Thank you. So quick to make in my instant pot and great for the start of my Whole30. I used vegetable stock and didn’t have paprika on hand but it was plenty spicy without it. Would love to hear how you did this in IP. I’m never sure how to convert. Hi there – the instant pot instructions are in the recipe. You’ll cook it for 20 minutes on the manual setting with a quick release. Question: I really want to try this but I am a spice whimp. It is a really spicy dish? I am sure I can just cut back on the chili powder if need be. Thank you! It can be a crockpot and cook all day for you. Since you can brown everything right in it there are less dishes than with a crock pot too! Yes, it’s true! Great details for people to know in case they are interested in purchasing an IP! It has so many features, and I really think the possibilities are endless with it! Thanks for stopping by and taking the time to leave a comment! I just go my instapot in the mail the other day and am planning on trying this recipe tomorrow night! I’ve never used an instapot before… when it says cook for 20 minutes is that on the manual setting or the “soup” setting? Good question! I will go in and update the recipe to reflect it, but we just do 20 minutes on the manual setting. Hope you love this recipe and enjoy your new IP! If you have time come back and let us know how it went! ? In the Instant Pot you just load it up, hit manual and adjust the time to 20 minutes – it’s neither low nor high, just the pressure cooker doing its thing. If you wanted to cook in a crockpot on high, that would be 3 hours. I’ll update the recipe for cooking on high in a crockpot. I just noticed it doesn’t say that. Thanks! Hope you get a chance to try this one out! It’s been a hit! What type of bone broth do you use? The fresh kind or the boxed store kind? What sort of pressure release? Am I able to freeze half of this? Would it be best to do so before or after cooking? What is your bone broth recipe? How large would a serving be? Justin eats more than me, and he’ll usually have a pretty full bowl and mine will be about halfway or a little more full. Eating in those sizes we’ll get about 3 meals for the both of us out of one batch. Hope that helps and that you give this one a try! I apologize if this is a redundant question, but was wondering what the calorie count is per serving? Can I Put in frozen chicken thighs? If I do, does it adjust the cooking time any? Thanks! We haven’t used frozen thighs but you could use them. You would have to adjust the cooking time up from 20 minutes to 25-30 minutes to ensure the chicken gets cooked through. Let us know how it goes! Correct, you can just put the chicken thighs in raw. We hope you enjoy the soup! Quick Question – my husband cannot have poultry could we substitute pork or beef instead of the chicken? We haven’t tried this with anything other than chicken thighs but you could try ground pork or beef instead and see how it goes. Hi Nicole – We don’t calculate or track the nutritional information for our recipes so we are not sure if this is technically a “keto” recipe. We suggest that you add the recipe to an online nutrition info calculator such as https://recipes.sparkpeople.com/recipe-calculator.asp to see if it fits into what you are looking for. Is the 3 hours on high in addition to the 6-8 hours on low? No – You would cook it for either 3 hours on high or 6-8 hours on low (choose one or the other). I’ve updated the recipe to make this clearer. Thanks for clarifying and we hope you enjoy the recipe! This recipe sounds excellent and I can’t wait to try it with my new instant pot! 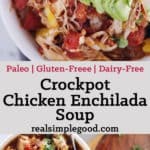 Question: in the “spirit” of an enchilada soup, could I add some original nut pod creamer to the base to give it that creamy/cheesy taste? Would that mess up the recipe too much? Vanessa – We haven’t tried adding in anything creamy like that but I bet it would be great! Let us know how it goes :). I tried it this time around just using the recipe you gave and OH MY GOODNESS is it amazing!!! I would definitely classify this as a Chicken “tortilla-less” soup instead of enchilada soup. Most enchilada soups I know of always have a cream base and this was very close to my favorite tortilla soup recipes. The instant pot had this ready in no time at all! I stuck all the ingredients in, went to the gym, and came back to a delicious meal ready to go! I had some Trader Joes ingredients that made prepping this super fast and gave it a little kick. I don’t usually use peppers in my cooking, so I had a bag of Trader Joe’s frozen fire roasted grilled peppers/onions waiting for me in the freezer. I only had chicken breast so I defrosted that and put it in there as well. Then instead of Chili powder, I had Trader Joe’s Chili Lime seasoning. I think this gave it that tangy kick that I loved so much. I’m a big time lover of lime juice, so I put a bit of that in there as well. This is definitely going to be a staple. My husband and I had enough for several meals last week. I’m going to experiment with the nut pods later on this fall/winter to give it that creamy texture and nix some of the lime juice. I’ll let you know how it goes! I don’t have a Whole Foods near me. Can i use a chicken or vegetable broth/stock instead? And any particular reason to use thighs other than preference? I have chicken breast in the freezer now ? thanks so much!!! You can definitely use what you have on hand – go with the chicken or vegetable stock and chicken breast if that’s what you already have. We like bone broth for the added gut health benefits and chicken thighs are just a preference. Enjoy! You’ll have to let us know what you think! I’m pretty excited. I just found bone broth at my local Aldi! I grabbed some. I’m going to be making this tomorrow for dinner since we’re having a cold front move through and it’ll be kind of dreary! Soup is always better on rainy, cold days ? This is delicious! I see that is says 237 calories per serving, but I don’t see where it says how much a serving is. Is it a half cup or…? We didn’t measure the serving out exactly, but it’s more like 1.5 to 2 cups per serving. The entire recipe is 6 servings if that helps. Glad you liked the recipe! My brilliant daughter taught me this time-saving tip-cooked chicken can be in seconds using your electric mixer. Just put the cooked meat by itself (without the broth) in a large mixing bowl, and shred with the mixer in seconds! I couldn’t believe how easy it was! Just beware! it works so quickly, you’ll pulverize the meat, if you’re not careful! What a great tip, thank you for sharing! Will rotisserie chicken work just the same? It would work but since that is already cooked you could just shred the rotisserie chicken and stir it in at the end. You could also cut the cooking time to about 10 minutes.Let us know how it goes!